Let’s start with…how to make a mimosa! A mimosa typically combines juice and champagne. The traditional mimosa recipe you find just about anywhere is orange juice and champagne. Since it is lower in cost usually, you will see a prosecco mimosa on the menu in a lot of places too. So, what is the best champagne for a mimosa? That really depends. A dry champagne (brut) is usually the standard but a lot of people prefer a less dry or even a proscecco which is typically a little sweeter. I don’t think there is a right or wrong answer but should be a matter of choice. A mimosa is so easy to make that it almost seems to silly to actual write up a mimosa recipe. For this recipe, I like to put sugar on the rim of my glass for fun. Just dip the top of the glass in juice or rim it with an orange. Then, dip into sugar. 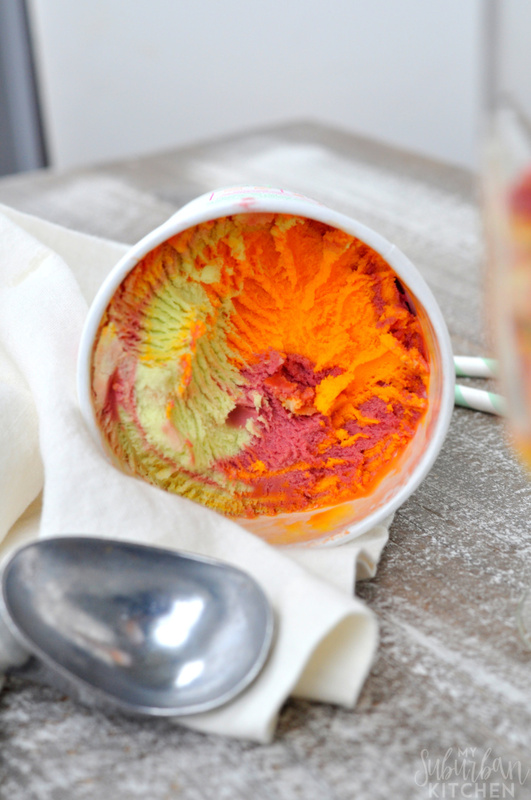 Rainbow sherbert is so ideal for this because it still offers that citrusy taste similar to orange juice. Once you have the sherbert in the glass (I use about a full scoop to scoop and a half), pour your champagne or prosecco in. 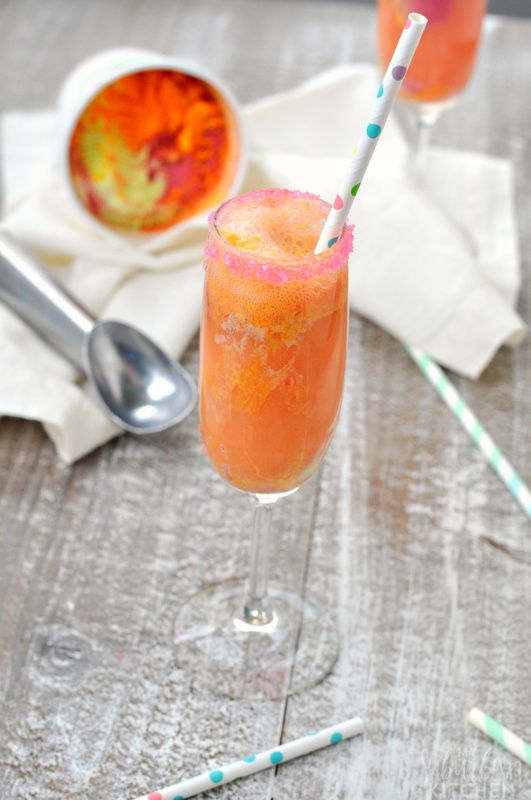 These rainbow sherbert mimosas make the ultimate bridal shower drink and are so perfect for a girl’s day brunch too. 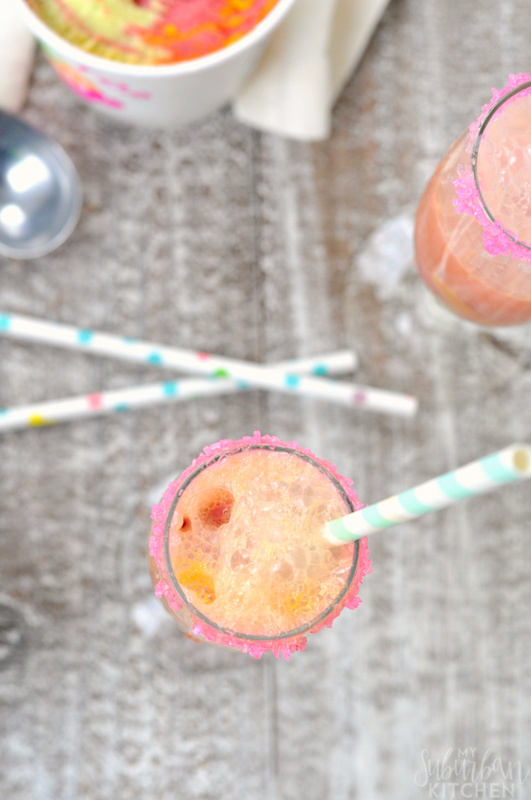 If you try this rainbow sherbert mimosa recipe or any other recipe from the blog, I’d love to hear about your experience. Let me know in the comments or snap a photo and tag it #MySuburbanKitchen on Instagram and Twitter. 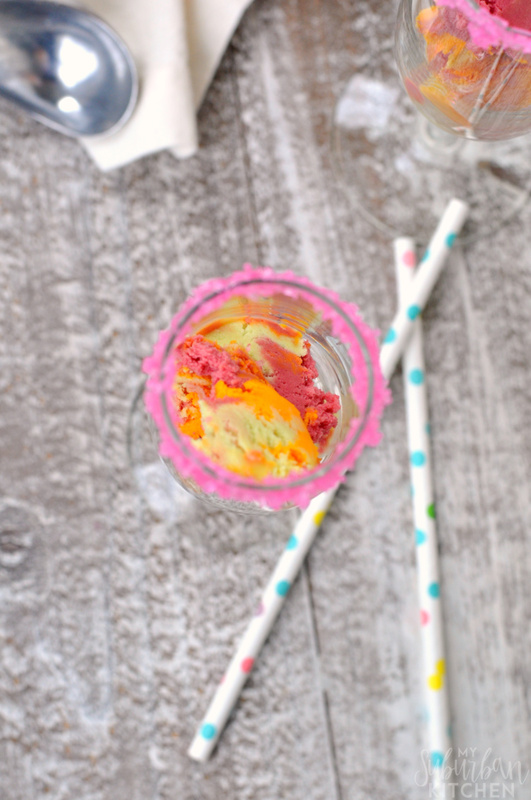 Spoon 3-4 Tbsp of rainbow sherbert into champagne glass. 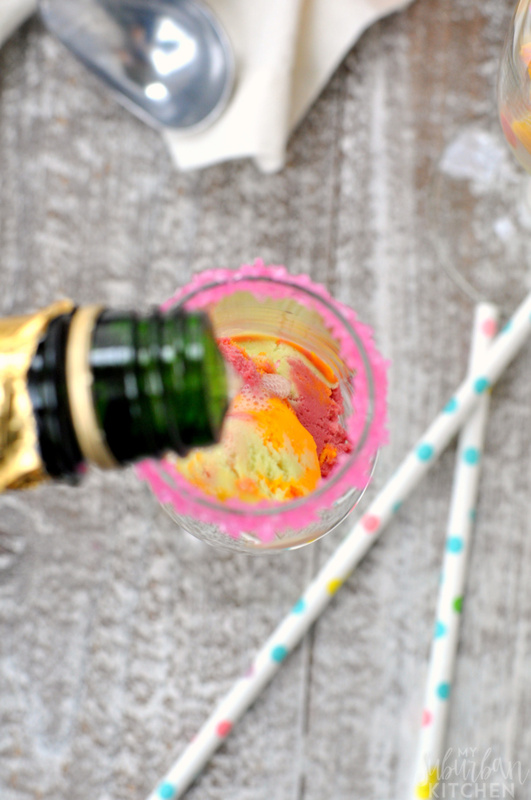 Pour dry sparkling win on top of sherbert. Serve immediately. Proscecco is fine in place of a dry sparkling wine or champagne. It will just make a sweeter mimosa.